And once again I am sucked into another Black Hammer book. Great start and a new mystery building on the mystery of Black Hammer. Lemire is setting up another fun series and issue 1 captured my sense of intrigue. If your a fan of the Legion of Super-Heroes AND a fan of Black Hammer - this book is especially for you. Even if your not a big fan of the Legion - pick this up! The Black Hammer universe is one of the best, most refreshing universes to come out since the reboot of the Valiant universe. 4 our of 5 Martians for the intro to this time and world. 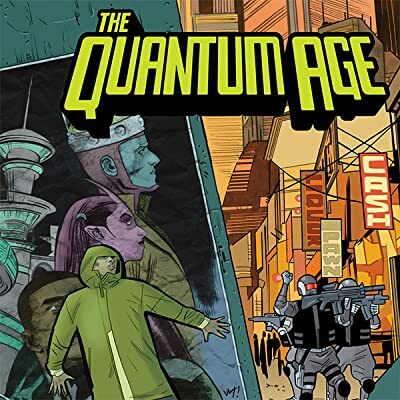 Perhaps my expectations are way up since reading the last issue of Black Hammer but my enjoyment of issue 2 of Quantum wasn’t as high. Not as good as the first issue but I’m hoping for a big payoff. Scared is what I am. This is suppose to be his Legion, but we need lots more issues for that to come around. Just finished issue 6 - the last issue. I'm going to have to think on this. I think I liked it but not sure. This ending is not what I expected and while I think I like the idea of it, it wasn't the big punch I'm used to. Not that that is bad, just different. Clearly this will tie into the Black Hammer main story with a hint as to how that will end. But I'm sure it's not as clear cut as that. Black Hammer seems to be a large tapestry with each of these mini's tieing into the larger story. Maybe I'll get it better when all is said and done. Agree. This is the weakest of the books.